iPad + Lutron: total home control, energy saving and some Green attitude too! 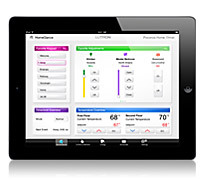 The iPad is cool because of applications such as Lutron‘s new RadioRA 2 control system. With the app, now available on iTunes for $19.99, owners of the RadioRA 2 can control their system from afar (say, on vacation) and put their home into “green” mode by turning off unneeded appliances. The Lutron Home Control+ application allows you to control your RadioRA 2 or Homeworks QS lighting control system over a Wi-Fi network with the convenience of the iPad, iPhone, and iPod Touch. Manage multiple RadioRA 2 and Homeworks QS systems in the same app. The RadioRA control application (and others like it) is certainly the future in home automation. More readings about iPad green attitude available here on Mashable! This entry was posted in App world, Apple, Energy, Home automation, iOS, iPad and tagged iPad, iPhone, Lutron. Bookmark the permalink.